ATLANTA, GEORGIA — Thousands of people converged on Atlanta, Georgia, recently to attend a convention honoring the walking dead: zombies in general, and the characters of The Walking Dead television show in particular. The convention was the first such gathering organized by two podcasters who produce a bi-weekly show called Walker Stalkers, celebrating all things The Walking Dead, including its post-apocalyptic Atlanta setting and the surrounding Georgia countryside in the U.S. southeast. Actors from the show signed autographs, posed for photographs and answered questions from fans. Lead actor Andrew Lincoln, who plays embattled sheriff Rick Grimes, made a rare public appearance. His character leads a small contingent of humans who defend themselves and their encampment in an abandoned prison against sporadic onslaughts of wandering zombies, known on the show as "walkers." Lincoln, who is British, was intrigued by the role because it was unlike anything he'd ever read before. "I’ve done comedy, I’ve done a lot of romantic roles, and things like that," he said. "And the opportunity to play a badass sheriff, I was like, 'Are you kidding me? Would I get to wear some boots and ride a horse and shoot people for a living? Count me in.'" 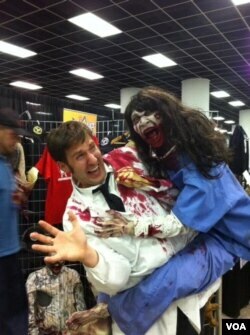 Some fans at the convention dressed as the show's human characters, while others decked out in zombie gore. They wandered through a maze of stalls offering a variety of merchandise, including zombie-themed sculptures and an animatronic zombie doll that wraps its limbs around your waist and growls at passers-by. Zombie culture is experiencing a renaissance in pop culture, but the allure of the genre may not be apparent to the uninitiated. While the thrill of blood and gore might be enough for some, the show's subtle hints at old-time movie Westerns may draw others. For fan Robyn Gerris of Vancouver, British Columbia, the world of The Walking Dead means a chance to start over. "The world needs a reset," she said, describing the world as a place where consumerism is out of hand and not enough attention is paid to human welfare. She says she likes the idea of a return to the basic needs of survival: food, shelter, companionship. Convention organizers James Frazier and Eric Nordhoff air a bi-weekly podcast called Walker Stalkers. Because this year's event drew such interest, they have already announced plans for not one, but two Walker Stalker conventions in 2014.